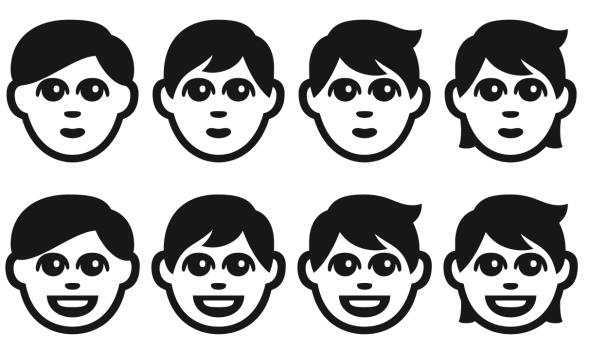 Paul Hunt made gender-inclusive emoji for non-binary individuals. Nongendered child, adult, and elder. Last May, Google laid out a proposal for gender equality in emoji. It wasn’t right, the authors wrote, that male emojis got to be police officers and construction workers while female emojis were limited to brides and princesses. The pitch, which the Unicode Consortium approved, added man options for the heretofore feminized emojis (haircut recipient; sassy hand lady) and woman options to the masculinized ones (rower; British royal guard). The emoji establishment finally became an equal-opportunity employer. As a genderqueer gay man, Hunt agreed that making users choose between caricatures of masculinity and femininity for each depiction of a person was not ideal. He put together a proposal that added a gender-neutral version for each human emoji, which would have allowed users to choose a feminine or masculine version only if they wanted to. The other decision-makers at Unicode opted against Hunt’s plan for systemic gender inclusion. But they did agree to add three new emojis: a child, an adult, and an elder, all designed by Hunt to be completely nongendered. They debuted last week with more than 50 other new emojis. I spoke with Hunt about the celebrity inspirations for the genderqueer emojis, the difficulty of signifying androgyny in a tiny cartoon, and the spiritual significance of gender nonbinary visibility. How did you become the one to spearhead the gender-inclusive emoji project? I care about these issues. I identify both as genderqueer, meaning I prefer not to be labeled as a man or a woman, but for the sake of other people I also do identify myself as a gay man just because that’s a concept that’s easier for people to latch onto. But my politics and my identity are definitely more about being queer than they are about being gay. I could see the benefits of having additional gender-inclusive representation so that people who don’t subscribe to binary concepts of gender would hopefully have some emoji representations they felt would be adequate for using themselves. I tried to talk to as many people as I could to try to make sure that I was developing artwork that hopefully other people could interpret as being gender-inclusive enough or androgynous enough—depictions of the child and the adult and the older adult that people could look at and they wouldn’t necessarily think “Oh, this is definitely a man” or “This is definitely a woman.” It would be something that would leave a bit of a question in peoples’ minds so that they would not try to force a gendered interpretation on it, as hard as they might try. That seems like a tough task, especially because it seems like a lot of signifiers of androgyny in cartoon characters would read as masculine—like short hair, and things like that. You really hit the problem on the head, because there is a bias, I believe, in our culture to view and interpret basically anything as male by default. That’s a bias that you have to try to work with whenever you’re trying to make something seem androgynous or not specifically gendered as male. I tried to do some research by getting people to do ratings of various existing emoji and some of the emoji I was working on at the time. What I felt like I found out was that the only real signifier you can use in emoji is hair length. So if you want to try to arrive at an androgynous image, especially in something that’s going to be so simplified and small, the solution that I chose was to use kind of a medium-length hairstyle that could be either a man’s or a woman’s hairstyle. Other things like the eyes and the nose and the mouth or ears are just too small to make that amount of difference at a very small size. Did you make any adjustments to those facial features anyway, to make them more gender neutral? I’m designing my own emoji set, and I had previously done several versions of men and women emoji. In my own designs, I think I made the man’s eyes a bit wider, more open. I made the woman’s mouth a bit more soft, with slightly larger lips. And I made the width of the woman’s nose just a little bit more petite. And so for the androgynous version, I tried to kind of average out these differences that I had made between my emoji man and my emoji woman. But I think at emoji size, these differences will not really be noticeable. That’s why I felt like focusing on the hairstyle was basically the only thing that I had to fall back on, unless I wanted to really try to differentiate all of my faces to a higher level—but I already feel uncomfortable enough differentiating men’s and women’s faces to the point that I did. I don’t want to be perpetuating concepts about gender; I have to try to be mindful of that and try not to overcaricaturize. I’ve tried not to make those differences so large that my emoji woman would look like some dolled-up lady in very heavy makeup, you know? That was never what I wanted to do. I found that even some of my women friends felt having these overly feminized versions of emoji was something they didn’t necessarily like either. And I feel like having these androgynous emoji may actually be good choices for men or for women who feel like, yes, they identify as men or women, but they don’t necessarily identify with a particular masculine or feminine stereotype. Were you inspired by any real-life genderqueer people? I have my own style icons—definitely David Bowie, Tilda Swinton, Ruby Rose. I even looked at plenty of pictures of Justin Bieber because, you know, he’s a current style icon, and to me, his style is fairly androgynous, especially with that haircut. There was a bit of a funny thing that came up—as part of Google’s proposal, they had proposed this new rocker image. It’s this emoji of a man or woman with brightly colored hair and this Ziggy Stardust thunderbolt across their face. And some sharp-minded people picked up on this and they said “OK, that’s great that we have these things, but in the real spirit of David Bowie, wouldn’t it make more sense to have an androgynous version of the same imagery?” And for me, that really confirmed that I was on right track, that having just masculine and feminine versions of these things is just not enough to capture full range of humanity. One criticism that I’ve made about the emoji expansions is that offering two gender expressions for each emoji is actually more limiting. If there’s just one option per emoji, you can assume it’s a stand-in, an imperfect symbol. But when there’s a girl and a boy, I almost think it’s more prescriptive of gender norms. You can’t just be rock climber. You have to be a boy rock climber or a girl rock climber. In some ways I do feel that the gendering of emoji has been unfortunate, mostly because it has removed these options of being able to communicate emoji concepts in ways that doesn’t automatically rely on these concepts of gender. Sure, it’s great that now we have a new rock climber emoji, but can’t it just be a rock climber person? Does it have to be a rock climber woman or a rock climber man? And with my [initial] proposal, this is the main issue that I was trying to address. I fought for all of the naming to be gender-neutral—so instead of having the mermaid in Unicode 10, there’s a merperson. Why is it important for people, especially genderqueer or gender non-binary people, to have representation in the emoji language? Part of reason why this whole project was important to me is because I see that our culture really devalues anything it sees as being feminine. We tend typically to think of masculine as active and good and feminine as weak and passive, and I feel like when someone accepts that they can be active and they can be passive, they can be strong and they can show their weaknesses, that’s real strength. Working on this proposal and trying to get these concepts into emoji was best way I knew I could contribute to promoting this type of consciousness. I hope it’s effective—I feel like it could be, since emoji is such a popular thing and it’s becoming an important part of our day-to-day communication. Hopefully it could give more and more queer and non-binary people the ability to express themselves and these concepts in a way that they can be seen and really be heard. Beyond that, I’m full of weird occult philosophy that all ties in with these concepts as well. Um, I would love to hear more about that. I think that in all spiritual traditions, the goal is to bring us to this androgynous state. The gods of most of our spiritual traditions originated as androgynous gods that had both feminine and masculine aspects to themselves. This concept and image of androgyny is something that has existed all through time. And I think that’s just another reason why these concepts should also be in emoji. Not only are they important to the queer community and anyone who views gender in a non-binary way, but they are also important symbols for people who see that doing this work to honor our masculine and feminine sides is not just a political stance, but a spiritual stance as well. So do you feel like you’re bringing emojis closer to our spiritual truths? Well, I think that’s part of why people like using emoji, and I think that’s part of the benefit of emoji. It’s really an aid that helps us to communicate our more intuitive aspect, our more emotional aspect of ourselves. Before emoji, people tried to use emoticons and were making these smiley faces. I think that emoji has replaced a lot of that, but I think that using these types of smileys can add the context that people sometimes need to know: “OK, is this person making a joke? Or are they serious? Are they angry with me? Are they just pretending to pick a fight?” And even the first emoji image that existed was just a little emoji heart. The creator of emoji was in an interview and he said he thought it was amazing how just sending a little picture of a heart in a text to someone could actually evoke a stronger feeling of love and affection.